This year’s Bangalore Book Festival was neither better nor worse than usual, which is to say that it mainly offered the advantages of visiting a number of more or less ordinary bookstores in a single venue. I am always on the look-out for translations of literature from different countries and regions into English, but if this was a focus area at the Festival, it was not evident to me in the few hours I spent there. By and large, apart from the special focus sections on Kannada literature, the exhibitors had the usual run of the mill fare you find in any city bookstore. There was very little effort made to offer special material at the Festival. Penguin has a great series of Modern Classics going on, and their stall was especially pathetic in this respect, with barely a handful of these titles on display. Similarly, I would have liked to see booksellers trying to offer sets of releases from some of the better literary lists in the publishing world today (Vintage Classics, NYRB Classics, Canongate Myths and specialist stuff life the excellent Wordsworth Mystery & Supernatural series). Instead, I saw a lot of random displays of bestsellers, mass-market paperbacks and coffee table books. The only stalls with any real substance for someone looking for unusual and old books were East West Books and the stalwart Select Book House. One expects the newer semi-used book stores to try and distinguish themselves by offering a focus on contemporary and genre literature to complement the older stores’ focus on antiquarian books, but no such luck. I expect to go to a book fair to find books that I cannot find on an average day’s trawl through the bookstores on MG Road and Church Street. I was largely disappointed in this respect. 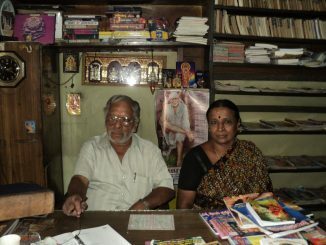 The Gupta circulating library in Malleswaram, has been serving over three generations of readers. What makes Mr Gupta continue? The 10 day book festival saw thousands of people flocking in to take a look at the lakhs of books that were on display.